The online poker community in New Jersey fought long and hard for the legalization of online poker and will be delighted this Saturday, the 27th New Jersey Championships of Online Poker (NJCOP) will be officially launched. The online poker market in New Jersey has not done as well as some of the experts initially predicted and this tournament will hopefully serve as a catalyst to rally the online poker community in New Jersey and take online poker to another level. The tournament is being sponsored by PartyPoker and the Borgata Hotel Casino & Spa. PartyPoker will also look to promote its brand and increase its player base as it has only recently re-entered the U.S poker scene and is looking to capitalize and capture a bigger percentage of the market share. The New Jersey Championships of Online Poker will only be open for those poker players who are physically present in the state of New Jersey. Hence, those poker players who wish to take part in the tournament but are not in New Jersey will have to make plans to visit the garden state. The tournament is scheduled to run for a period of two weeks and has a combined guaranteed prize pool of $600,000. 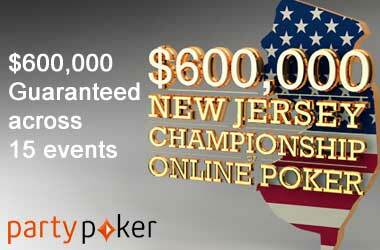 The main event of the NJCOP will be $200,000 guaranteed prize pool along with a minimum guarantee of $50,000 for the winner. The entrance fee for the main event will be $200. The NJCOP will kick start on Saturday with a $50,000 freeroll that will commence at 4PM Eastern Time and is expected to draw a huge player pool. Saturday will also host a special $20,000 guaranteed tournament with a $100 buy in. Sunday is expected to get even better with a $100,000 guaranteed event that will see the eventual winner get a minimum of $25,000. Most of the events that take place during the two week tournament will feature No Limit Texas Hold’em. However, there are a few events that have a different format such as the “Player’s Choice” event which has a $20,000 guarantee payout and comes with a $100 buy in. The NJCOP is expected to draw a high number of poker players because the tournament has been strategically designed to take place along with the World Poker Tour‘s World Championship which is also being held in New Jersey.